This garden bed is at it's peak...most of the rest are already past their prime, all down hill from here...sob. Another wonderful collection of plants. Is that a coleus near the front? They aren't going to die just yet! Fantastic Colours Flcrazy, That does'e look like a Coleus, Lovely colour..
Iv'e Counted 25 different plants, probably more, BEAUTIFULL, Border Flcrazy...Dee.. Thanks everyone ! Yes that is a coleus, it's my favorite, it's called 'saturn'. I love planting it with anything that has chartruese leaves, and I'm sure you've all noticed by now, I have alot of things with chartruese leaves...lol. I know,... I need help....~smiles ! That is an amazing flower bed. Oh, I'm speechless, this is an amazing garden, you clever thing, it's perfect. I could just do with a large print of that on my kitchen wall. Thanks for the wonderful compliments everyone ! You're much too kind..., ( but I love it anyway)...lol ! Wonderful picture. What do you mean "down hill from here" - some of us haven't had much uphill at all this year!!! Haha...Magnoliatree, quit trying to pull my leg..lol ! I've seen your garden this year and it looks great ! Absolutely beautiful...... it's got the wow factor! Thanks Grenville and Popeymike, your opinions are greatly appreciated ! Stunning is the word that comes to mind! Wow! Yes beautiful. I especially like that coleus. So do I. Altogether fabulous. Well done. Please tell me, where do you live? I am in the Uk , very south of. It is nice to know where everyone is gardening. I think. Hello Joyoustub, welcome to GOY ! I 'm from America, and I live and garden on the east coast, in the state of North Carolina. Thanks for your kind comments, can't wait to see your posts ! 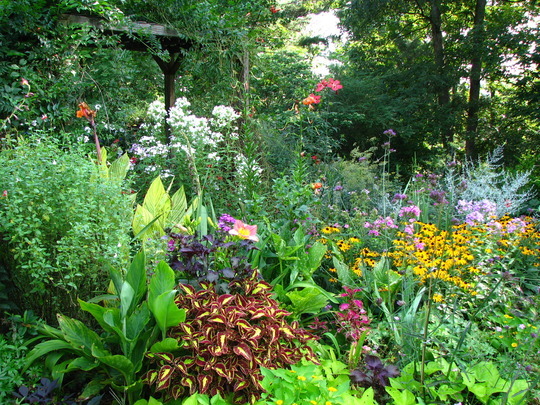 amazing well done, love this type of deep border with masses of different forms and colours . Well for someone who says I'm not an 'expert' - that's quite a show! - and I'm sure beautiful moments in Winter. and there is next year to look forward to - new ideas to try - it never ends ! Thanks, your comments are greatly appreciated ! This is lovely, so colourful. Thanks Keithsmom, will have to post a pic of how it is filling in so far this year for you. It's not quite at this point yet, my rudbeckia will not be open for another few weeks. It's beautiful - would love to see how it's doing this year. I envy your ability to get the proportions right!